Ingredients: 1 chocolate cream filled roll, 375ml thickened cream, 1 tub Pauls Double thick Chocolate custard, 250ml carton Pauls thick Vanilla custard, Raspberry Jam, Tim Tams, a variety of chocolates (Flake, Aero bar, Kit Kat, Cherry ripe, Peppermint crisp etc), Baileys. Method: Slice the chocolate roll into thin slices and spread with jam. Layer the sides and base of a trifle bowl with cake (press to sides). Drizzle cake with Bailey’s (depending on taste). Spoon in a layer of chocolate custard (to just above cake level) & top with remaining cake slices drizzled with more Bailey’s. Top with chopped Tim Tams (not to the sides of the bowl), pour over a layer of vanilla custard, smoothing to the edge and layer custard with whipped cream. Drizzle cream with more Bailey’s (3-4 capfuls). Layer cream with chocolates of choice - chopped Tim Tam’s, flake, peppermint crisp. For a Christmas version, use chopped aero bar or peppermint crisp & cherry ripe. Refrigerate until ready to serve. Note: Trifle can be made the night before. (Each time you make this, you will find yourself adding something different. It's so easy !). STEP 1 TRIFLE BASE: Create your trifle base with a raspberry jelly made with fresh berries and a splash of lemonade. STEP 3: Add a layer of vanilla panacotta followed by a layer of vanilla ice cream with chopped macadamia's mixed throughout. Keep the ice cream in the freezer however until just before serving. STEP 4: Serve topped with loads of fresh berries! STEP 2: Next add 3 layers of jelly, all different flavours. STEP 3: Add a layer of cream followed by a middle layer of sponge fingers or sponge roll. STEP 4: Top with a layer of custard, lots of fresh fruit and finish off with some whipped cream. STEP 2: Mix fresh berries with vanilla or berry flavoured dairy free yoghurt. STEP 3: Layer your crumbled cake pieces with melted vegan dark chocolate drizzled on top. STEP 4: Finally top it all off with fresh berries, mango and a mint leaf for decoration. Drizzle a little more melted chocolate on top just for fun! 2. Pour coffee into shallow dish. 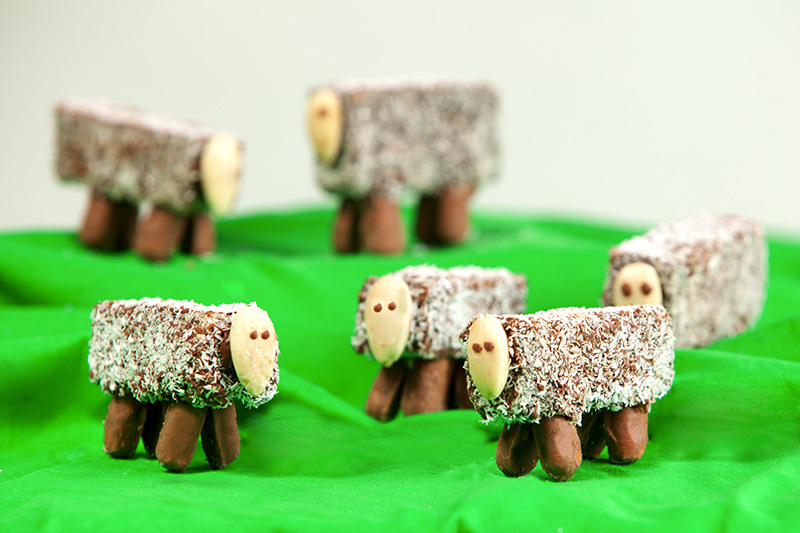 Soak lamington fingers a few at a time then layer in serving dish using half the lamingtons. 3. Spread and cover lamingtons with half the cream. 4. Repeat another layer of soaked lamingtons, then cover with remaining cream. 5. Cover and chill for a couple of hours. These adorable little Lamb-ingtons are super easy to make and what's better, no animals were hurt in the making of this product. What's an Australia Day BBQ with Lamb-ingtons? !